A treatment wetlands system helps maximize nutrient removal. At the end of June 2018, ShoreRivers was awarded a $2.2 million dollar grant from the Chesapeake and Atlantic Coastal Bays Trust Fund managed by the Maryland Department of Natural Resources to support ShoreRivers’ regional agricultural restoration work. The grant will fund projects in the watersheds of the Bohemia, Sassafras, Wye, and Choptank Rivers. Together these projects will prevent over 14,200 lbs. of nitrogen, 740 lbs. of phosphorus, and almost 270 tons of sediment from entering Eastern Shore waterways. · An ecologically engineered design that will stabilize excessive gully erosion that has resulted in a ravine adjacent to Kings Creek in Talbot County; it will create a wetland and grassed buffers, and restore 1380 linear feet of stream and agricultural ditch. · A treatment wetland system and stormwater retention ponds at the bottom of four agricultural drainages and above a natural stream. The project is designed to maximize nutrient removal at the top of the watershed of Little Bohemia Creek in Cecil County and it will create almost six acres of wetland and three acres of stormwater ponds. · Stormwater ponds and over eight acres of lined treatment wetland to treat 33 acres of dairy farm operations and several hundred acres of row crop land that is irrigated with lagoon effluent from a Kent County dairy in the Sassafras watershed. · Completing restoration of a 1,000-linear-foot traditional agricultural ditch into a two-stage ditch with wetland benches on a grain farm on the Wye River in Talbot County. 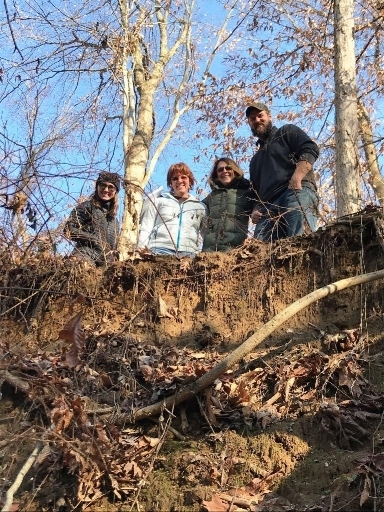 Pictured left to right at a restoration site are ShoreRivers staff members Emily Harris, Kim Righi, Kristin Junkin and Josh Thompson.